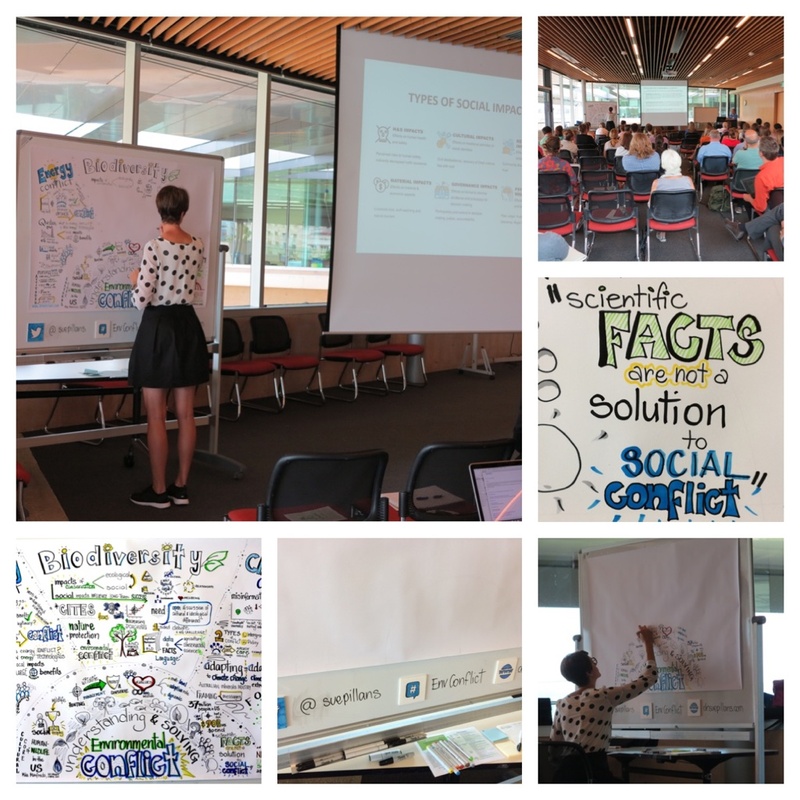 I was recently invited to graphically record the Network of Environmental Social Scientists (NESS) Forum on Environmental Conflict held at the University of Queensland, in Brisbane. The Forum brought together a diverse group of researchers and practitioners from Universities, research organisations and conservation groups to discuss three key themes 1. Energy 2. Biodiversity and 3. Climate Change. Understanding and solving environmental conflict is a complex issue as it is often highly emotive and political, so hearing about the experiences of such a group was extremely interesting. It was also extremely fast, full-on and fun (…on the pens that is), as I visually captured 10 presentations in four hours!! My role at such a Forum is to help draw out the major issues, key messages and common themes from the researchers and practitioners to create a visual story of their experiences and knowledge. I’m excited that the visual story I created will now help in further discussions across disciplines to help with social solutions to environmental conflict! It is also very rewarding to see how my visual stories are used post-event as I have just received a request from a Social Sciences Institute in India to use my graphics to help teach their students about environmental conflict in a course on Population, Migration and Environmental Change! WOW! And these visuals are now part of the NESS website, where you can also download copies of the Forum presentations: https://envirosocialscience.org/2016/11/21/the-ness-2016-environmental-conflict-forum/ You can also follow my creative journey via my alter ego Dr Suzie Starfish on Facebook (https://www.facebook.com/drsuziestarfish/) and @suepillans on Twitter and Instagram. ← My Dream Job started with Lobsters! Thank you Louis! It was a great Forum to “picture” all the ideas!